In Zhezkazgan, Kazakhstan on Sunday October 30, 2016 (Kazakh time) the Soyuz MS-01 spacecraft with the Expedition 49 crewmembers returns after 115 days in space. When the Expedition 49 mission to the International Space Station (ISS) came to an end over the weekend, three space travelers returned to Earth on a Soyuz spacecraft while a NASA photographer capturing their arrival from the air in some spectacular photos. Expedition 49 crew members safely returned to Earth after spending 115 days aboard the International Space Station NASA astronaut Kate Rubins, Russian cosmonaut Anatoly Ivanishin of Roscosmos, and astronaut Takuya Onishi of the Japan Aerospace Exploration Agency (JAXA) touched down near the town of Zhezkazgan, Kazakhstan on Sunday (Oct. 30). 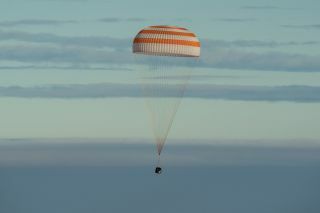 Video of the crew exiting the Soyuz shows the three in good spirits and glad to be home. After touchdown, the trio of space travelers underwent standard field tests to assess their physical health before taking helicopters back to the staging grounds in Karaganda, Kazakhstan. Following an official welcoming ceremony with Roscosmos, the crew parted ways with Rubins and Onishi heading to Houston, Texas. The Soyuz MS-01 spacecraft, with the trio of Expedition 49 crewmembers inside, touches down near the town of Zhezkazgan, Kazakhstan. During her stay in space, Rubins contributed to the Biomolecule Sequencer experiment among other new studies aboard the space station. These new biological studies on the ISS, specifically DNA sequencing, could allow astronauts to diagnose illness or even identify potential health threats in microbes growing onboard. The trio of crewmembers from Expedition 49 — NASA astronaut Kate Rubins, left, Russian cosmonaut Anatoly Ivanishin of Roscosmos, center, and astronaut Takuya Onishi of the Japan Aerospace Exploration Agency (JAXA) — rest outside the Soyuz MS-01 in chairs, waiting to enter the medical tent for initial testing before returning to Karaganda, Kazakhstan. Rubins, in her first trip to the International Space Station, also left the safety of the space station for two spacewalks with NASA astronaut Jeff Williams while she was in space. During the extravehicular activities (EVAs), the astronauts installed the station's first international docking adapter. They also installed two additional high-definition cameras and removed an extra thermal control radiator.